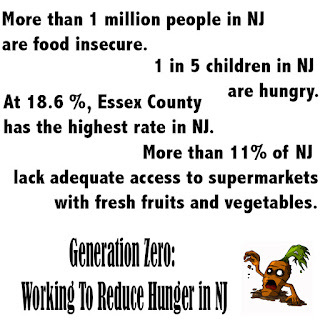 Please join us in raising money for the 2nd Annual Generation Zero: Working to Reduce Hunger in NJ. New Jersey faces a food insecurity crisis. Nearly 150,000 people go hungry everyday in Essex County, alone - the highest rate for any county in the state. Last year we raised over $5,000 to purchase fresh produce for the Interfaith Food Pantry of the Oranges and the Food Pantry at Our Lady of Sorrows in South Orange. This year our goal is to raise $15,000 and we will add Isaiah House in East Orange to list of recipients. The donated produce will help feed more than 600 individuals per week. 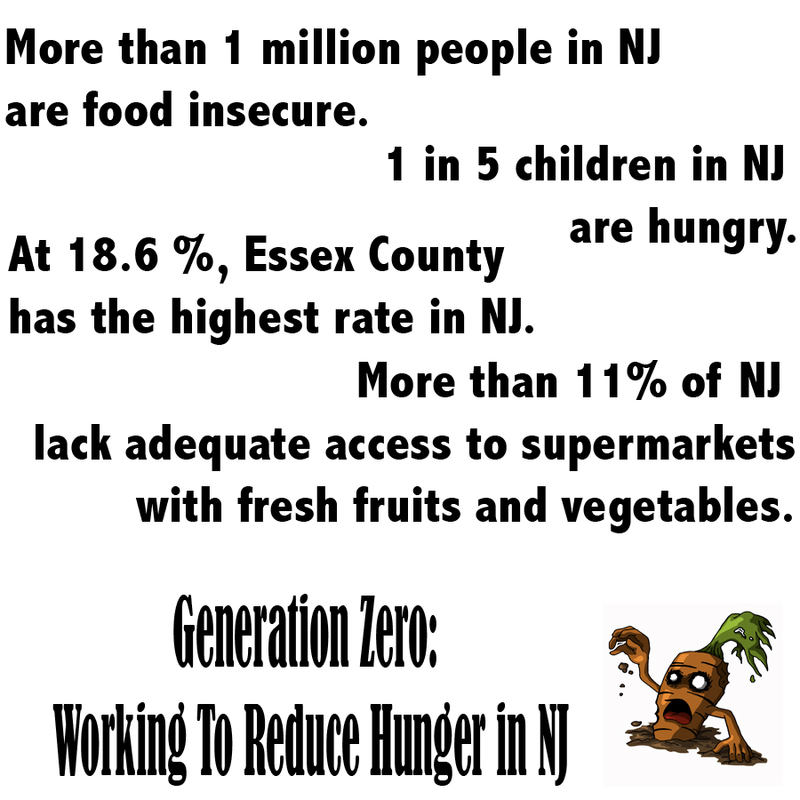 Over 1.1 million people are food insecure in New Jersey. About 45% of the them do not qualify for government assistance because they make a little more then the amount that you need for help. In Essex County alone, there are about 141,000 people (out of 800,000) who are food insecure. Our local farmers need our support. Farming is a hard business, and the farmers always strive to provide the community with quality, delicious produce at affordable prices. However, it has become increasingly more difficult to do so. Some key challenges our farmers face include: climate change, drought, decreasing bee populations, limits on hiring migrant workers, and competition from big food businesses. Now more than ever they need our support. Without our support these small local farmers will most likely go out of business. All funds raised by Generation Zero will go to purchase weekly produce from Farm & Fork Society for these food pantries. 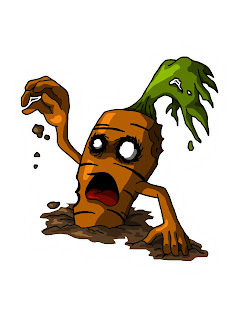 In turn, these organizations can rely upon a weekly source of fresh fruits and vegetables. The cost for one 24-Week Vegetable & Fruit Share is approximately $1,000. Our goal is to purchase at least 15 shares. Investors Bank has graciously sponsored our fundraising effort and committed to donate significant amount of money! Background: Generation Zero was originally started by Elijah Goldberg as “mitzvah” project in Spring, 2016, to mark his 13th Birthday. The term mitzvah is a Hebrew word that has come to express an act of human kindness. Learning that there are over a million people who are food insecure in New Jersey, 1/3 of them are children, Elijah decided to do something. The name Generation Zero is derived from Generation Z (aka Gen Z) those born in years that range from the mid-1990s to early 2000s. Elijah and Farm & Fork Society have teamed up in 2017 to reach a broader audience.